It’s Autumn in Stuttgart, just before Halloween, and thirty-something mothers Judith and Leonie are safely ensconced in their upmarket apartments in one of the city’s best neighborhoods. Judith has squeezed her life into the straitjacket of wholesome stay-at-home motherhood – no TV, no sweets, nature hikes, and, above all, routine – and marriage to staid university professor Klaus. Leonie is proud of her work at a bank and her husband Simon’s career, though she worries that she’s neglecting her young daughters, and that Simon’s work distracts him from his family. Over the course of a few days, Judith and Leonie’s apparently stable, successful lives are thrown into turmoil by the secrets they keep, the pressures they’ve been keeping at bay, and the waves of change lapping at the peaceful shores of their existence. Shorter Days is both an ‘exorcism of women’s fears’ and a heartrending exploration of the joys and challenges of modern family life. Anna Katharina Hahn was born in 1970. Her other works include the collection of stories Kavaliersdelikt (Petty Crime), for which she was awarded the Clemens Brentano Prize in 2005, and Am Schwarzen Berg (The Neighbours) in 2012. 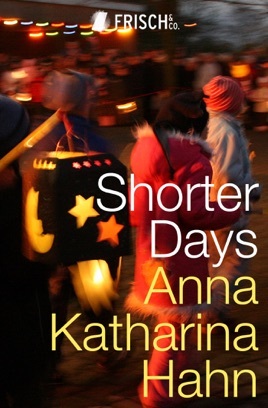 In 2010, Anna Katharina Hahn was awarded the Heimito von Doderer Literary Award. Shorter Days was longlisted for the German Book Prize in 2009.